Emre Can was linked with a move to Juventus recently. 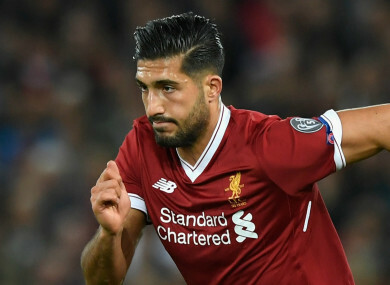 JUVENTUS HAVE NO intention of making a move for Emre Can in January despite his contract running down at Liverpool. The Germany international is set to become a free agent next summer, with no fresh terms agreed at Anfield as yet. An inability to put an extension in place means that the Reds run the risk of losing Can for a limited fee over the winter or for nothing at the end of the season. That situation means that the 23-year-old is free to speak to any interested parties outside of England from January, regarding a permanent deal at that stage or a pre-contract agreement. Juventus have been heavily linked with a move for his services but the club’s CEO, Giuseppe Marotta, insists that they will not be bolstering their ranks when the transfer window re-opens. He told Rai 2: “We will not sign anybody in January. Juve sit second in their Champions League group at present, behind La Liga giants Barcelona. They are already guaranteed at least a third-place finish and a spot in the Europa League, but have two games left in which to book a place in the last-16 of Europe’s premier club competition. Those endeavours will be complemented by a domestic title bid, which has seen the reigning champions get the defence of their crown back on track of late. Having suffered a slight wobble in early October, which saw them drop five points across meetings with Atalanta and Lazio, Juve have collected three successive victories to move back to within a point of leaders Napoli. Can, meanwhile, has remained a regular for Liverpool throughout the uncertainty surrounding his future. He has made 15 appearances for the Reds this season, with the most recent of those coming in a 4-1 victory over West Ham. It remains to be seen how many more outings he will take in, with Jurgen Klopp having conceded that Can could be removed from his plans at some stage in the coming months. He told reporters on an expiring contract: “It’s part of football. If it happens, we can’t change it. Email “January transfer boost for Liverpool as Juventus rule out Emre Can raid”. Feedback on “January transfer boost for Liverpool as Juventus rule out Emre Can raid”.